19 Sep - Page posted. Course Duration: 8 days (8am to 6pm daily). 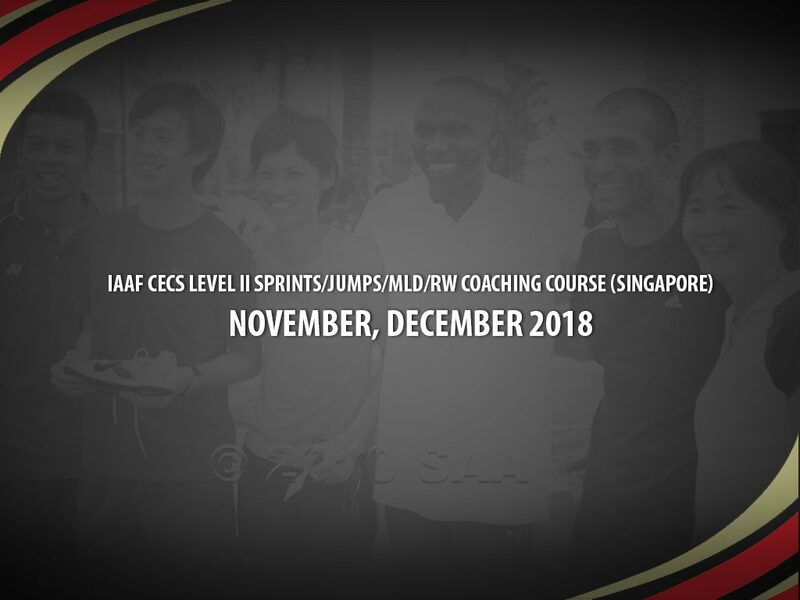 Compulsory to attend the full 8-day course as per the IAAF requirements. Application Closing Date: 6pm on Monday, 15 October 2018 (All relevant certificates, where applicable, must be submitted by 6pm on Monday, 15 October 2018). Assistance: Any enquiries please contact SAA or call +65 63862721. For coaches who is not eligible for Level II or Old Level III, may submit supporting documents for appeal. The final decision in selection lies solely with IAAF. I. Share your experiences in high-performance sports. II. What are your experiences with sprints and hurdles / jumps / MLD/RW events? III. Who are the athletes you’re currently dealing with? IV. What are your future (professional) goals? V.	How are you able to contribute to the development of athletics in Singapore? VI. Why should you be chosen to attend the course? * Relevant documents (IAAF CECS Level I certificates – front & back, CV, cover letter, referral letters etc.) must be accompanied together with your online application form and payment. All applications are given consideration according to the date the completed application & payment are received by the SAA. Applications without payment will not be considered complete until payment is received.